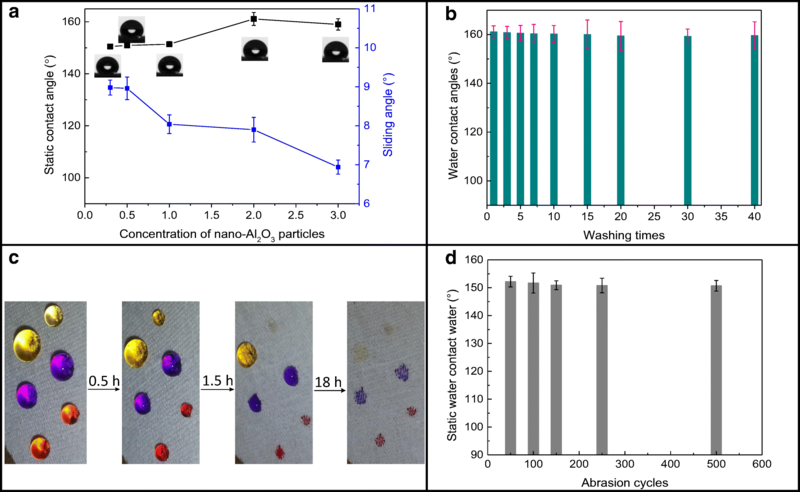 A series of novel superhydrophobic/superoleophilic cotton fabrics with the use of hybrid coatings combined with polyvinylsilsesquioxanes (PVS) polymer and nano-Al2O3 particles were developed successfully by solution immersion. The influences of the concentration of nano-Al2O3 on surface morphology, composition, water-repellent properties, and durability of the treated cotton fabrics were investigated in detail, respectively. Subsequently, oil/water separation performance and self-cleaning ability of the treated cotton fabrics were examined. It is interesting to find that the novel cotton fabrics treated with the hybrid coatings of PVS polymer and nano-Al2O3 exhibited enhanced mechanical properties, excellent water-repellent properties, and durable mechanical stability with the increasing concentration of the nano-Al2O3 particles, compared with cotton fabric treated by the sole PVS without adding nano-Al2O3 particles. Meanwhile, the treated cotton fabrics exhibited high oil/water separation efficiency of 99% and excellent self-cleaning ability when the concentration of nano-Al2O3 particles in composite coatings increases to 2%. The hybrid coatings combined with the PVS polymer and Al2O3 particles are promising in exploitation of superhydrophobic/superoleophilic materials, which can be applied to many fields including oil/water separation, wallpaper and soft tiles, and clothing for oil recovery, water-proof and self-cleaning applications, respectively. Superhydrophobic/superoleophilic cotton fabrics with high oil/water separation efficiency were developed successfully by hybrid coatings of polyvinylsilsesquioxanes and nano-Al2O3 particles. Crude oil, as one of significant natural resources, has greatly promoted social progress of human beings. However, frequent oil leakage and oil spill accidents have led to severe water and soil contaminations during oil exploitation and transportation, which usually bring catastrophic impacts to ocean ecosystem and aquatic environment [1, 2, 3, 4]. The oil-polluted water usually contains harmful and toxic chemicals, which incited extensive attention because of the increasing discharge of industrial oily wastewater as well as the laboratory wastewater. Fortunately, oil/water separation technique affords a promising environmental remediation for oil spills in oceans and rivers. However, conventional techniques, such as centrifugation, absorbents, skimming, and biological treatment, are suffering from the disadvantages of low efficiency, high-energy consumption, secondary pollution, high operation cost, and so on when they are used for the separation of oil/water mixtures [5, 6, 7, 8, 9]. Therefore, advanced materials or techniques with low cost are urgently needed to deal with various oil/water mixture efficiently. Over the past decades, considerable attention has been paid to exploitations of artificial superhydrophobic/superoleophilic materials for oil recovery from water [10, 11, 12, 13, 14]. It is well known that superhydrophobicity/superoleophilicity is a typical environmental adaption during evolution of diverse creatures . Inspired by many natural surfaces of lotus leaves, butterfly wings, and rose petals, artificial superhydrophobic surfaces with static water contact angle greater than 150° and sliding angle less than 10° can readily be constructed [16, 17]. For instance, some superhydrophobic porous materials in the forms of metal meshes , foams [19, 20], sponges [21, 22], filter paper , and gels  have been successfully developed and widely utilized for oil/water separation. Obviously, most of these porous materials can absorb large amounts of spilled oil into the pores, but these materials also suffer from some deficiencies, such as low oil/water separation efficiency, time-consuming synthetic steps, poor durability, weak mechanical strength, and high cost, which limit their real-life applications . Owing to the intrinsic woven pores, many efforts have been devoted to the exploitations of facile, inexpensive, high separation efficient superhydrophobic fabric-based materials. In comparison with diverse substrates, cotton is eco-friendly, low cost, and abundant in nature; hence, cotton fabric-based materials are considered the optimum candidates for oil/water separation [6, 11]. It is well established that artificial superhydrophobic surfaces can be created low surface energy from chemicals and high roughness on the surface of substrates . However, many hydroxyl groups available on surfaces of cotton fibers make cotton fabric hydrophilic. To transform hydrophilic cotton fabrics into hydrophobic ones, some expensive and toxic fluoride polymers are commonly employed [12, 27, 28, 29]. Due to environment concerns, many scientific researchers are inclined to utilize some environmentally friendly and fluorine-free polymers with low surface energy to develop superhydrophobic cotton fabrics. Recently, polydimethylsiloxanes (PDMS), as typical one class of the most important polysiloxanes, have been widely employed as adhesives to prepare superhydrophobic cotton fabrics [21, 30, 31, 32, 33]. However, the other polysiloxanes with hydroxyl groups have been seldom utilized as coatings to fabricate superhydrophobic cotton fabrics except for liquid methylsiloxane resin . Therefore, these reactive polysiloxanes may have great potential in constructing superhydrophobic cotton fabrics. In our recent work , the reactive polyvinylsilsesquioxane (PVS) has been applied to cotton fabrics and endows them with good thermal stability, but their hydrophobic properties are undesirable due to the limited woven surface roughness. To further increase surface roughness, some inorganic nanoparticles, such as SiO2, ZnO, and TiO2 [36, 37, 38, 39, 40, 41], have been commonly employed to roughen the substrate surfaces to fabricate superhydrophobic cotton fabrics. 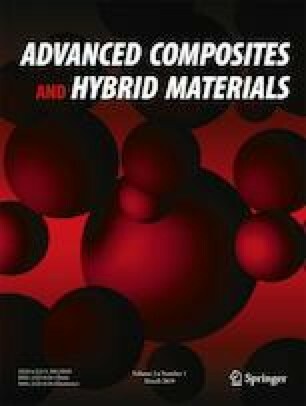 In recent years, due to high thermal stability and low cost, aluminum oxide particles have been extensively applied on surfaces of various substrates including glass-based materials, aluminum alloy, wool fabric, and glass slides as hybrid coatings for achieving antireflective , anti-wear , superhydrophobic [44, 45], and anticorrosion functionalities . However, no work on superhydrophobic cotton fabrics has been reported using nano-aluminum oxide particles as hybrid coatings. Hence, it is very promising to develop superhydrophobic cotton fabrics using nano-aluminum oxide particle hybrid coatings. Meanwhile, to further reduce the cost of materials, the nano-aluminum oxide was utilized to increase the surface roughness of cotton fabrics. To the best of our knowledge, there are no further reports on cotton fabrics functionalized with hybrid coatings consisting of the PVS polymer and nano-aluminum oxide. This work is mainly focused on the effects of concentration of nano-aluminum oxide on hydrophobic properties, surface morphology, and durability of the cotton fabrics treated with the PVS/nano-aluminum oxide coatings. In the meantime, oil/water separation performance and self-cleaning ability of the treated cotton fabrics were examined. 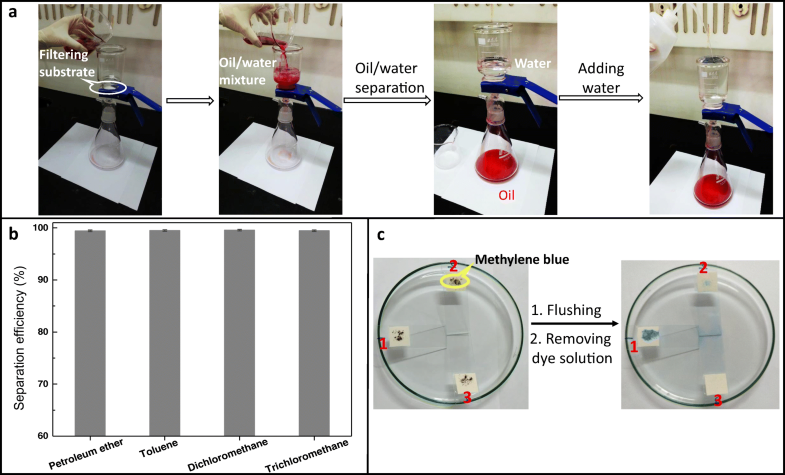 This work provides a one-step method to fabricate superhydrophobic cotton fabrics with high oil/water separation efficiency and self-cleaning ability, and these functional fabrics exhibit numerous potential in oil/water separation and industry oil wastewater purification. Desized, scoured, and bleached cotton fabric (200 g/m2) was obtained from Jinqiu Textile Company, Shaoxing, China. Vinyltrimethoxysilane (97.9%) was kindly supplied by Nanjing Chengong Silicon Co., Ltd., Nanjing, China. Concentrated hydrochloric acid (37%), methylene blue (AR), orange G and acid red 112, oil red O, anhydrous ethanol (AR), and α phase nano-aluminum oxide (about 30 nm) were purchased from Shanghai Reagent Plant, China. Toluene (AR) and silicone fluid (PMX-200, 50 cSt) were purchased from Tianjin BoDi Chemical Reagent Co., Ltd. All the chemicals were used as received. Polyvinylsilsesquioxanes (PVS) was prepared according to our previous work [35, 47]. where W1 and W2 are the weights of cotton fabric before and after treatment, respectively. With an increment in the concentration of the nano-Al2O3, the add-on percent of treated cotton fabrics also increased from 6.90% for CPAl-0 to 35.7% for CPAl-3, as shown in Table 1. The washing experiment was carried out according to a modified literature method . In brief, the washing procedure was performed in a 500-mL beaker containing 200 mL distilled water and 1.0 g detergent (main ingredient: sodium dodecyl benzene sulfonate) by magnetically stirring at 300 rpm for 30 min at 40 °C. Subsequently, the washed fabrics were moved from the detergent solution and rinsed within 200 mL distilled water with stirring for 15 min. Finally, the laundered cotton fabrics were obtained by drying the rinsed cotton fabrics in the air oven at 120 °C for 1 h. The entire procedures are defined as one washing cycle. Zeta potential was measured by dynamic light scattering (DLS) using a Malvern Zetasizer Nano ZS (Worcestershire, UK). For these measurements, 0.01 wt% of particles was added in aqueous media and subsequently dispersed by ultrasonication for 30 min. X-ray diffraction (XRD) analysis was carried out on an UItima IV (Rigaku Corporation) X-ray diffractometer with Cu Ka radiation; the steps size and scan rate were 0.02° and 5 °C/min, respectively. Morphologies of the as-prepared cotton fabrics were conducted on a JSM-IT300 (JEOL Ltd., Japan) scanning electron microscope (SEM) at voltages of 20 kV, respectively, after the samples were sputtered with thin platinum layer. 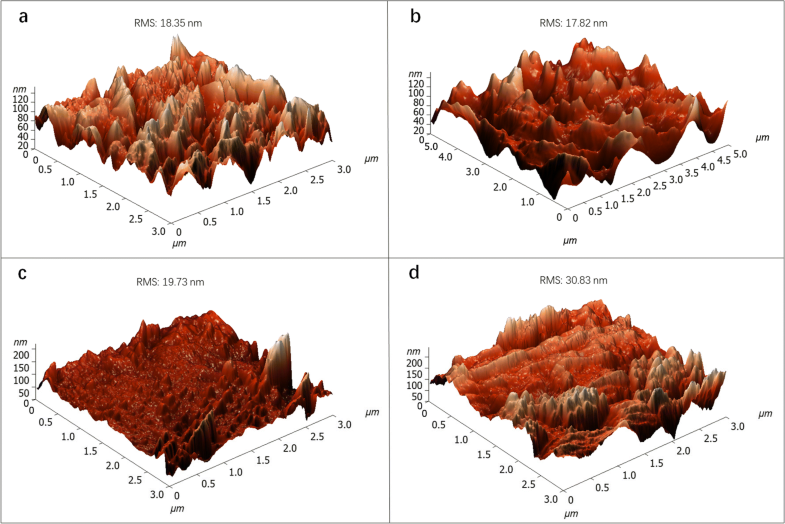 The surface elemental analysis of cotton fabrics coated by composite coatings was characterized by energy dispersive X-ray spectroscopy (EDX) attached to the SEM. Surface roughness was tested by using an atomic force microscope (AFM, Dimension Loon, Bruker Company). The tensile strength, elongation at break, and modulus of the treated cotton fabrics were measured according to the GB/T3923-1997 standard test method. At least three measurements for each sample (25 cm × 5 cm) were recorded. Static contact angles and rolling angles were measured utilizing deionized water droplets (i.e., 5 μL for static contact angle, 15 μL for rolling angle) with a KRŰSS contact angle instrument (DSA 100, Germany) at room temperature (25 °C). Average values of water contact angle (WCA) and sliding angle were obtained by measuring at least five different positions on the same sample. To verify colloid surface interaction between the Al2O3 nanoparticles and the PVS polymer, zeta potential values of the pure nano-Al2O3 dispersion, the PVS polymer solution, and the PVS/Al2O3 hybrid coatings were measured, respectively. Figure 1 clearly shows that zeta potential values of Al2O3 nanoparticles and pure PVS polymer solution in ethanol are about + 18.2 mV and − 4.4 mV, respectively. 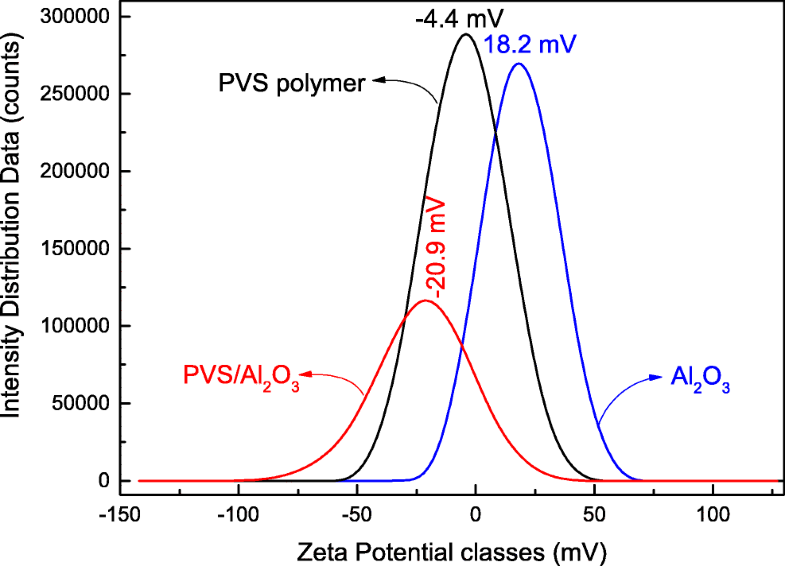 After hybridization, the zeta potential value of the PVS/Al2O3 hybrid coatings is shifted to − 20.9 mV. This remarkable changes from positive charges to negative charges on the surface of colloidal particles further corroborate that chemical interaction could occur on the surface of the Al2O3 particles by capping the PVS polymer, as proposed in Scheme 2. 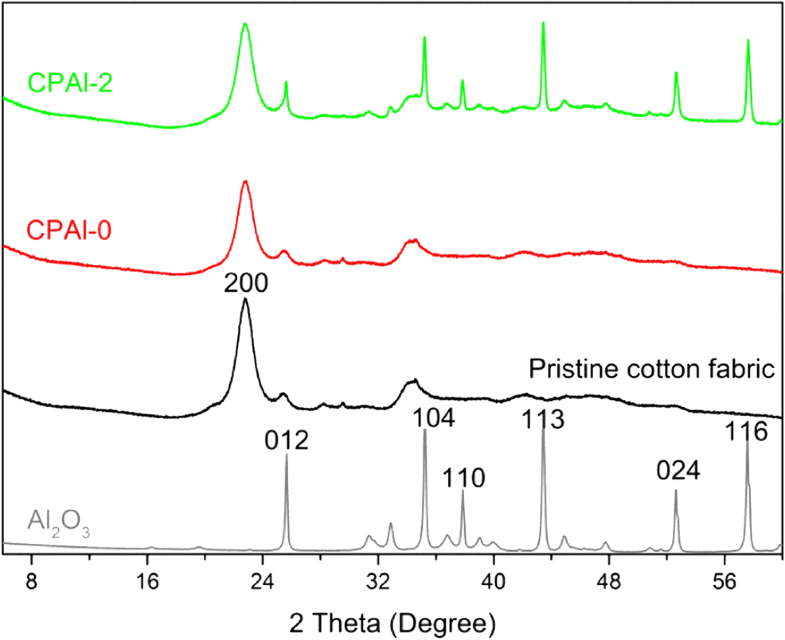 Figure 2 shows XRD patterns of nano-Al2O3, pristine cotton fabrics, and the representative cotton fabrics finished with PVS/Al2O3. It is noteworthy that after being coated with the sole PVS polymer, the diffraction intensity of peak at 22.8° (corresponded to 200 plane) attributable to the characteristic crystalline phase of the cellulose fibers  becomes weak as compared with that of the pristine cotton fabric. When the pristine cotton fabric was further treated with the PVS/nano-Al2O3 hybrid coatings, some new diffraction strong peaks evidently appeared at 25.7°, 35.2°, 37.8°, 43.5°, 52.6°, and 57.6°, which were ascribed to the (012), (104), (110), (113), (024), and (116) crystal planes of rhombohedra α-Al2O3 [50, 51], respectively, indicating that the nano-Al2O3 particles were successfully coated on the surface of cotton fabric. 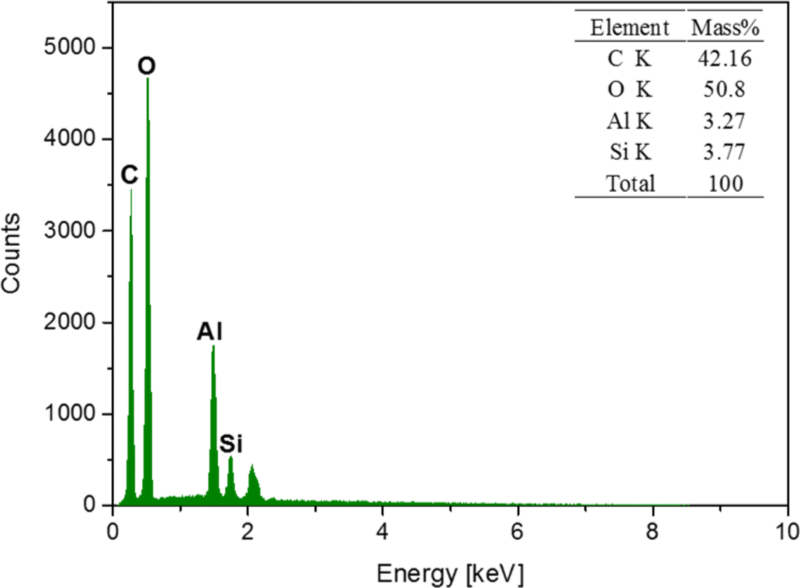 Moreover, according to (116) plane calculation by the Scherer equation, the average diameter of the virgin Al2O3 particles is about 41.8 nm; it was found to decrease to 38.3 nm for CPAl-2. This decreased average diameter of Al2O3 particles further corroborates that the surface condensation reaction of hydroxyl groups originating from cotton fibers, the PVS polymer, and Al2O3 particles occurred during the curing process, as shown in Scheme 2. The surface of pristine cotton fabric is smooth; no particles are found, but some aggregated Al2O3 particles immobilized on surfaces of the cotton fibers resulting from the cotton fabrics treated with the PVS/nano-Al2O3 hybrid coatings are clearly observed. More notably, with an increase in concentration of Al2O3 nanoparticles, more and more aggregated Al2O3 particles are available on the surfaces of cotton fibers originating from the treated cotton fabrics. Meanwhile, adhesive phenomenon between cotton fibers is also observable after the PVS/nano-Al2O3 hybrid coatings were cured, as exhibited in Fig. 3a–f. In order to further observe surface microstructures of cotton fibers, the selected domains in red boxes in Fig. 3a–f are magnified, and their SEM images are provided in Fig. 4a–f. Many micro-grooves and ridges are found on surface of cotton fiber from the pristine cotton fabric. After being treated with the PVS/nano-Al2O3 hybrid coatings, these instinct micro-grooves and ridges are covered, and the surface of the treated cotton fibers become smooth in comparison with the pristine cotton fabrics, as shown in Fig. 4a, b. 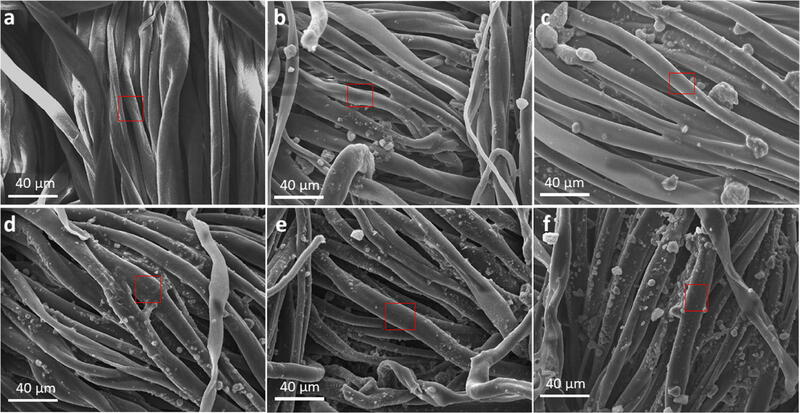 With the concentration of nano-Al2O3 relative to the volume of ethanol increasing, more and more aggregated Al2O3 particles immobilized into PVS film on the surface of the treated cotton fibers appeared, as shown in Fig. 4c–f. These embedded Al2O3 particles remarkably roughen the surfaces of cotton fibers after treatment with the PVS/nano-Al2O3 hybrid coatings. Furthermore, the chemical compositions of a representative sample CPAl-0.5 were analyzed by EDX. On the surface of the treated cotton fabric, there are mainly four elements such as C (42.16%), O (50.8%), Si (3.77%), and Al (3.27%), indicating that the hybrid materials of PVS polymer and Al2O3 had been successfully coated on the cotton fabrics, as shown in Fig. 5. To clarify the effect of the embedded particles on surface roughness of the cotton fabrics, surface root mean square (RMS) values of the treated cotton fibers were measured by means of AFM characterization, which are provided in Fig. 6a~d. When the cotton fabric was treated with the sole PVS polymer, the RMS value of cotton fiber surface is about 17.82 nm, which is lower than 18.35 nm for the pristine cotton fabric, as displayed in Fig. 6a, b. This slight reduction in RMS value further verifies that the grooves on the surface of the cotton fibers are completely filled in after treatment with the PVS/Al2O3 hybrid coatings, leading to a smooth surface as compared with the pristine cotton fibers. Afterward, the RMS value of cotton fibers from cotton fabrics treated with these hybrid coatings increased from 19.73 to 30.83 nm with an increase in the concentration of Al2O3 nanoparticles, as shown in Fig. 6c, d, suggesting that micro-/nano-structures have been successfully constructed on the cotton fiber surfaces by the treatment of the PVS/Al2O3 hybrid coatings. Collectively, it could be concluded that the cotton fabrics were successfully modified by conformal hybrid coatings formed by chemical condensation among cellulose fibers, the PVS polymer, and Al2O3 nanoparticles, and the surfaces of the modified cotton fibers are gradually roughened with the increase in the concentration of Al2O3 nanoparticles. It is well documented that some nanoparticles usually compromise the mechanical property of cotton fabrics after treatment. To further clarify the effect of the concentration of Al2O3 nanoparticles in hybrid coatings on mechanical property of cotton fabrics, their tensile property was examined. As no Al2O3 nanoparticles were added in hybrid coatings, the tensile strength at maximum load of the cotton fabric treated with the sole PVS polymer is about 331 ± 17 N. After adding Al2O3 nanoparticles in hybrid coatings, the tensile strength at maximum load of the treated cotton fabrics slightly decreases from 562 ± 21 N for CPAl-0.3 to 448 ±19 N for CPAl-3 with the concentration of Al2O3 nanoparticles in hybrid coatings increasing, which is still much higher than 289 ± 8 N for the pristine cotton fabric . This enhanced tensile strength gives convincing evidence that the PVS/nano-Al2O3 coatings cannot compromise, but instead improve the mechanical properties of the treated cotton fabrics, as exhibited in Fig. 7a. Meanwhile, it is noteworthy that elongation at rupture of the treated cotton fabric without nano-Al2O3 particles is only19.7 ± 0.5%, but the elongation at rupture of the treated cotton fabrics is improved and kept around 30% with an increment of the concentration of Al2O3 nanoparticles in hybrid coatings, as displayed in Fig. 7b. In comparison with reference materials (CPAl-0), this mechanical enhancement of the treated cotton fabrics should be attributable to synergistic effect among the cotton fibers, PVS polymer, and Al2O3 nanoparticles. In order to estimate the superhydrophobic/superoleophilic property, some different liquid droplets (both toluene and silicone oil were dyed with oil red O, water was dyed with methylene blue) were dropped on the surface of the representative cotton fabric treated by the PVS/nano-Al2O3 hybrid coatings; both the toluene and silicone oil droplets were spread out and absorbed immediately on its surface, but the water droplet without shape changes was kept on its surface. These liquid droplet experiments clearly demonstrate that the cotton fabrics possess excellent superhydrophobic/superoleophilic property, as exhibited by optical photos in Scheme 1. To further investigate effect of the concentration of nano-Al2O3 particles in hybrid coatings on the wettability stability of the treated cotton fabrics, their static water contact angles and water sliding angles were measured. Combining with the PVS polymer and nano-Al2O3 particles, the static water contact angles on the surface of the coated cotton fabrics increased from 150.5 ± 0.6° for CPAl-0.3 to 161.1 ±2.5° for CPAl-2 firstly and then slightly decreased to 159.0 ± 2.2° for CPAl-3 with the increment of the concentration of nano-Al2O3 particles, which are still far higher than 122° for the sole PVS–treated cotton fabric , indicating that the nano-Al2O3 particles play a significant role in improving superhydrophobicity of cotton fabrics, as shown in Fig. 8a. At the same time, the water sliding angle value of the finished cotton fabrics reduces from 9.0 ± 0.2° for CPAl-0.3 to 6.9 ± 0.2° for CPAl-3 with an increase in the concentration of the nano-Al2O3 particles in the hybrid coatings. Therefore, the hybrid coatings consisting of the PVS polymer and nano-Al2O3 can efficiently improve superhydrophobicity of the treated cotton fabrics. To evaluate the washing durability of the treated cotton fabrics, the static water contact angle was measured again after the representative sample CPAl-2 was washed different times. Figure 8b clearly demonstrates that no remarkable changes have been found in the static water contact angle value of the representative cotton fabric, confirming that the cotton fabrics treated with the hybrid coatings consisting of the PVS polymer and nano-Al2O3 particles possess excellent washing durability. To examine superhydrophobic stability of the cotton fabrics treated with the hybrid coatings, water droplets dyed with different colors (0.1% dye) on the surface of the treated cotton fabrics (CPAl-3) can be kept for several hours (from 0.5 to 1.5 h), or cannot be assimilated into cellulose fabric by capillary action; only some dye stains were left on the surface of the treated cotton fabrics after the water evaporated completely, verifying that the hybrid coatings consisting of the PVS polymer and nano-Al2O3 particles can impart the treated cotton fabrics excellent water repellency stability, as displayed in Fig. 8c. To further examine the mechanical durability of the treated cotton fabrics, the sand paper abrasion experiment was carried out. In this test, sand paper (1200 mesh) was used as abrasion surface; the representative cotton fabric was placed faced-down onto sand paper under loading of 100 g and dragged forward along one direction (about 20 cm); this whole process is defined one abrasion cycle. The static water contact angle value of the representative sample (CPAl-2) was measured after its surface was abraded. After the surface of the representative cotton fabric (CPAl-2) was rubbed 50 times, its static water contact angle value decrease to 152.2 ± 1.9°, which is lower than that of the unrubbed representative sample (161.1 ± 2.5°). This reducing value of static water contact angle should be attributable to loss of surface roughness of cotton fibers after abrasion. It is noteworthy that the static water contact angle value of the rubbed cotton fabric slightly decreases to 150.7 ± 1.9° after 500 times of abrasion. But no remarkable changes can be observable in the static water contact angle value of the representative cotton fabric with an increase in abrasion times, verifying that the hybrid coatings consisting of the PVS polymer and nano-Al2O3 particles endow cotton fabrics with robust mechanical durability. Collectively, the hybrid coatings of the PVS polymer and nano-Al2O3 particles are promising water-repellent materials, which can be applied to many water-proof fields such as wallpaper, soft tiles, and clothing. Oil/water separation experiment was carried out by filtering common organic solvent/water mixture (1:1 volume ratio) such as petroleum ether/water, toluene/water, dichloromethane/water, and trichloromethane/water. For convenient observation, oil layer (organic solvent) was dyed by oil red O, and the representative cotton fabric (CPAl-2) was utilized as filtering substrate. After pouring into oil/water mixture into funnel, two individual layers were noticeably observed. After several minutes, the bottom chloroform layer dyed by oil red O quickly passed through the cotton fabric substrate, but the water layer was retained on the surface of the representative cotton fabric in the funnel, as shown in Fig. 9a. At the same time, driven by gravity, no water droplets pass through the functionalized cotton fabric until the funnel was fully filled with water. This oil/water mixture was completely separated into individual water and chloroform dyed by oil red O. And the similar experiments were carried out using the mixtures of petroleum ether/water, toluene/water, and dichloromethane/water, respectively. Notably, the separation efficiency of all the mixtures is up to 99%, as shown in Fig. 9b. At the same time, the self-cleaning experiment was simulated. Methylene blue powder was sprinkled on surfaces of the pristine cotton fabric, CPAl-0 and CPAl-2, and this dye was flushed with water. After several minutes, most methylene blue powder on surfaces of the cotton fabrics was carried away by the rolling water droplets; some dye stains were left on the surface of the reference materials (CPAl-0 and the pristine cotton fabric) by capillary action; only the CPAl-2 surface keeps clean. This neat surface demonstrates that the cotton fabrics treated with the hybrid coatings have excellent self-cleaning ability, as clearly exhibited in Fig. 9c. To sum up, these results mentioned above suggest that the hybrid coatings combined with the PVS polymer and Al2O3 particles impart cotton fabrics excellent oil/water separation and self-cleaning ability, which are promising potentials in oil recovery, water-proof and self-cleaning applications. Novel hydrophobic cotton fabrics are successfully prepared using hybrid coatings combined with the PVS polymer and nano-Al2O3 for the first time. The influences of concentration of nano-Al2O3 particles in hybrid coatings on surface morphologies, mechanical properties, and hydrophobic properties of the treated cotton fabrics are discussed in detail. And the oil/water separation performance and self-cleaning ability of the treated cotton fabrics are examined. Results show that the novel cotton fabrics treated with the hybrid coatings of PVS polymer and nano-Al2O3 exhibited enhanced mechanical properties, excellent water-repellent properties, and durable mechanical stability with the increasing concentration of the nano-Al2O3 particles, compared with cotton fabric treated by the sole PVS without adding nano-Al2O3 particles. Meanwhile, the treated cotton fabrics exhibit high oil/water separation efficiency of 99% and excellent self-cleaning ability when the concentration of nano-Al2O3 particles in composite coatings increases to 2%. Therefore, the hybrid coatings combined with the PVS polymer and Al2O3 particles are promising in fabricating superhydrophobic/superoleophilic materials, which can be applied to many fields including oil recovery, water-proof and self-cleaning applications. This work was financially supported by the National Natural Science Foundation of China (NO.51503161), the Foundation of Wuhan Textile University (173006), and the National Key Research and Development Program of China (NO.2016YFA0101102).